Unfortunately there is no safety standard across the industry for motorbikes, as there is with cars and Euro NCAP, so instead it comes down to personal opinion. But that’s not entirely true. While you cannot rely on a safety rating system you can judge a bike by a number of different criteria. Here, we outline what makes a bike safe, or at least what can help, because as the old adage goes, a motorbike is only as safe as its rider. The oldest and least powerful are drum brakes. 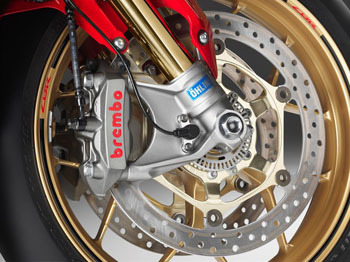 Drum brakes use shoes and pads to apply friction to a brake drum to slow or stop a motorbike. Drum brakes are becoming increasingly out-dated because the drums can overheat under heavy braking as they’re enclosed, hence their lack of use on high-capacity motorbikes. After drum brakes comes disc brakes and the most basic is a single disc braking system. This uses a disc, usually made of steel that is attached to the wheel and therefore spins as the wheel does. Callipers then press against this disc to slow the bike or stop it completely. With a single disc brake system, as the name suggests, there will be one disc per wheel and usually, on a motorbike, the front wheel will have a much larger brake disc and more braking power than the rear. The next level of brakes is a twin disc braking system. This uses two discs on either side of the wheel to give increased braking power. Again, the front disc will be larger than the one on the rear as they have to deal with more weight when braking. Disc brakes are preferred as they use air flow to disperse the heat heavy braking causes. ABS Is a brilliant safety system that helps wheels maintain traction and grip when braking by stopping wheels from locking. This means skidding is pretty tough with ABS. The system monitors revolutions of the wheel and applies different braking ratios and forces to prevent wheel locking. ABS systems require disc brakes and the discs are specially designed to ensure compatibility with the braking aid. Conclusion – The safest braking system is a twin disc system with ABS. Drum brakes are basic and are adequate on low-capacity scooters, bikes and mopeds however if the option is there, go with disc brakes, twins preferably, and if ABS is an option, definitely plump for that too.